Challenges - 100+ books, Well Read and A to Z titles. First paragraph - Like most people I lived for a long time with my mother and father. My father liked to watch the wrestling, my mohter liked to wrestle; it didn't matter what. She was in the white corner and that was that. This book is a semi autobiographical novel of Jeanette Winterson's early years. It shows Jeanette's early upbringing within a religious household. She was adopted into the family at an early age and was brought up by her adopted mother who was a fundamentalist Christian. Religion dominates Jeanette's life, she knows of no other way, her mother has convinced her that she will grow up to be a missionary. Her weekends and free time are spent in religious activities and pursuits to convert others. Spoiler Alert - if you haven't read it and you haven't seen the programme and you really want to, then scroll down to the next picture. In Jeanette's early years, she was not allowed to attend school with all the other heathens and was taught to read from the Bible. It wasn't until the local government stepped in and threatened her mother with prison, that she was allowed to attend school. Her religious upbringing and views made it very difficult for her to cope with the normal every day interactions at school. Jeanette tries to impress her religious views on the other children through her essays and her art work, much to the disgust of the teachers and the other parents. Outside of school, her only friends were the old ladies from the church. As Jeanette matures she starts to doubt her faith and begins to disagree with some of the religious teachings. As she reaches her teens Jeanette meets a young girl called Melanie and her feeling develop for her. As their relationship blossoms Jeanette shares the information of her new found love with her mother. This causes catastrophic repercussions, where Jeanette and Melanie are pulled in front of the church congregation to repent their sins. Jeanette unable to repent is locked in her room and starved until she gives in. Eventually Jeanette is turfed out of the home and the church and turns her back on religion in order to live her life as she feels comfortable with. I remember watching this when is was serialised in 1989 when it was considered very controversial. This was long before the first lesbian kiss of Beth Jordash in Brookside and when Mary Whitehouse ruled the television waves. I loved the programme and found it very refreshing. I was young and teenage and rebellious against the system. So watching anything controversial was right up my street. The programme had the late, great Charlotte Coleman playing the part of Jeanette, who international readers will only remember as the potty bridesmaid Scarlett from Four Weddings and a Funeral who shared a flat with Hugh Grant. Unfortunately she died of an asthma attack at the age of 33. For some reason, this information has always stuck with me as I have watched Charlotte grew up on television in various roles ranging from Worzel Gummidge and Marmalade Atkins up to Four Weddings. Anyway, I am digressing, the book was just as fabulous as the programme. There were parts in the beginning that had me in fits of laughter. Here is a passage concerning Jeanette's temporary deafness. Once I went deaf for three months with my adenoids: no one noticed that either. I was lying in bed one night, thinking about the glory of the Lord, when it struck me that life had gone very quiet. I had been to church as usual, sung as loudly as ever, but had seemed for some time that I was the only one making a noise. 'What's the Lord?' May was confused. 'Working in mysterious ways,' declared my mother, and walked ahead. So, unknown to me, word spread about our church that I was in a state of rapture, and no one should speak to me. How can someone be so caught up in their religious beliefs that they don't realise their child has a medical problem. Later in the chapter, one of the church women actually confront Jeanette's mother with hysterical consequences. As the book progresses, the story gets darker. 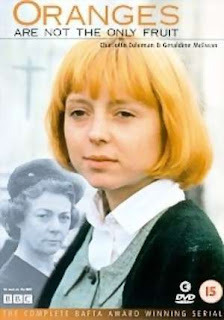 When Jeanette realises she is a lesbian and is no longer frightened to admit it, the church treat her very cruelly and she turns her back on all of them. They even attempt to perform an exorcism on her to rid her of what they believed were demons. It takes her a long time, to build up a new relationship with her mother on a standing that they can both cope with, but she never enters back into the church. Jeanette works hard to stand on her own two feet and you can feel nothing but compassion for her. Through out the book, Jeanette introduces many stories, as the book progresses, Jeanette starts to question those stories as myths as their is no factual evidence to prove them. I feel that this is the way Jeanette changes her feelings towards religions, as their are is no evidence to prove the readings she has been taught, so why should she abandon the lifestyle she chooses. 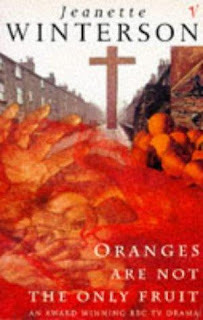 Oranges also play a key part in this story. When Jeanette is in doubt or unwell, her mother always gives her oranges as the only solution. On a deeper level, you can see that oranges represent how her mother views relationships. Her mother does not believe that any other relationship exists other than a man and woman together or should exist. From Jeanette's perspective, she has realised that oranges are not the only fruit, as heterosexuality is not the only type of relationship. There is so many areas in this book you could explore and examine and I could go on for ever, but I will stop now and venture to say that this is a fantastic thought provoking book that should be read. I did enjoy it and I would definitely recommend it. Apologies for such a long post and my wafflings, but I really want to explore this book more. Don't apologise - it didn't seem like a long post at all. Your enthusiasm is very infectious. So much so that I had trotted off to Amazon to look for the book /dvd before I realised I hadn't commented. Oops. Great post. I quite fancy reading that now. I never saw the tv programme, and didn't realise it was her in it. Really sad that she died - I remember hearing about that on the news. Not the kind of thing that you think people actually die of. Wow, what a story! Can you imagine having to live your life like that? You've made me want to read this book! I haven't heard of this book, but the religious upbringing sounds very familiar to me. I was raised in churches like this (thank goodness my mom wasn't like that though - she's very compassionate). But many of the people I knew growing up thought that any psychological problem was the result of demon possession. My grandmother regularly saw a psychiatrist and took medicine for her mental health and was always worried about what the church people were going to think of her. My father-in-law is also fundamentalist pastor, so I get to hear opinions that I no longer agree with on a regular basis. It's an uncomfortable position to be in. I'm looking forward to reading this even more after your fantastic review! I hadnt heard of this before. Great review! I love books that make you really stop and think. Hi Vivienne, I have an award for you here. This is one book I'd like to read. Thanks for the review, Viv!